To show how to configure a Business Transaction that splits web requests by user session attribute loginBean.getUserContext().getUserName(). 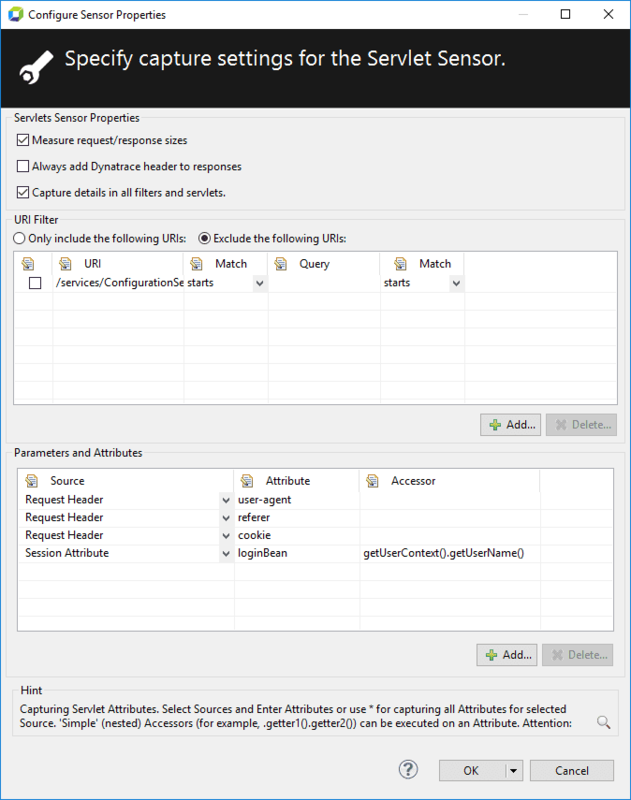 Configure the servlet sensor properties. Create the measure to use for splitting. Create the splitting Business Transaction. 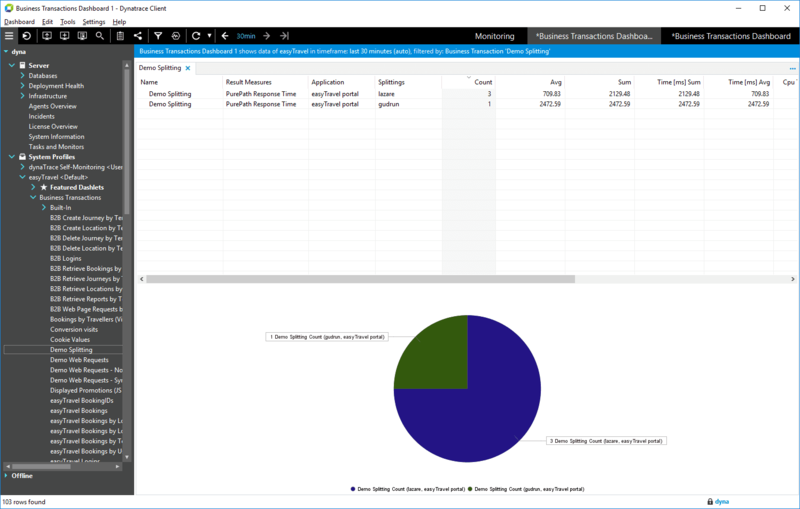 Run the demo application with injected agents and connect to a System Profile. If you use your own application, associate and activate the necessary web server Sensor. This tutorial may use naming based on the easyTravel demo app. To define Business Transactions based on a web request session attribute, you must enable capture of this parameter in the Configure Sensor Properties dialog box. Open the System Profile editor, and select the Customer Web Frontend (Java) > Sensor Configuration item. Double-click the Servlets sensor for editing. In the Parameters and Attributes pane, click Add, and select the Session Attribute in the Source column of the newly create row. You can enter a wildcard (*) to capture all parameters. However, this can result in capturing more data than you need and thus more overhead than necessary. A better approach is to enter action to capture the specific parameter. In the Attribute column, type loginBean. In the Accessor column, type getUserContext().getUserName(). Now you need a measure which serves as the input for the Business Transaction. In the System Profile Preferences dialog box, select the Measures item. 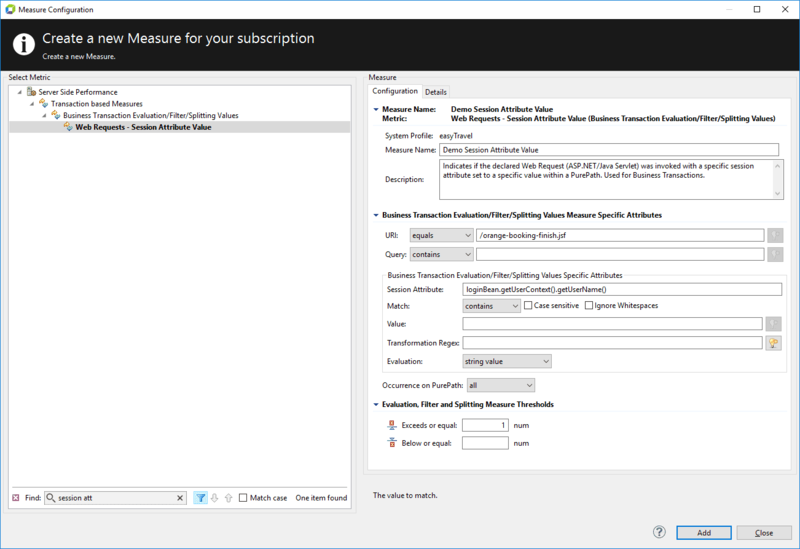 Click Create Measure to create a new measure. 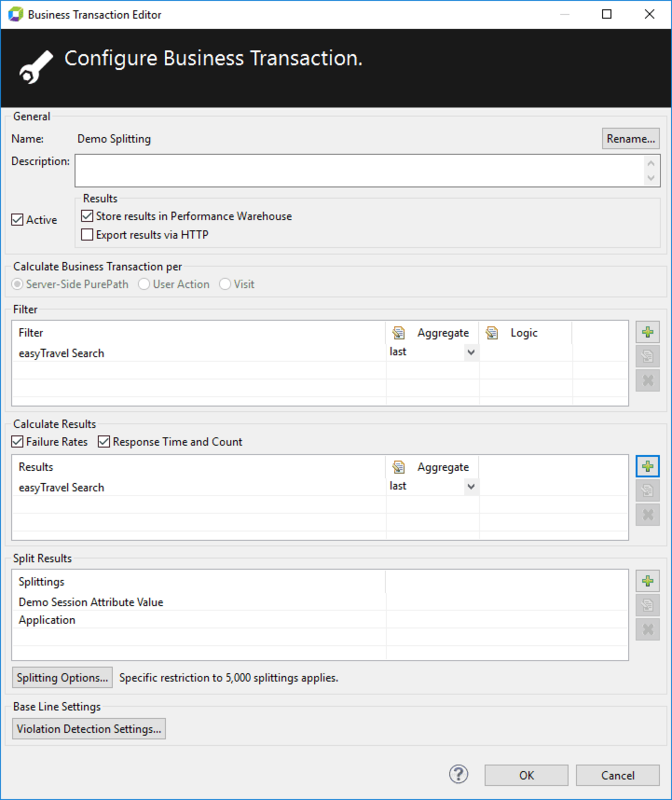 Find and select the Web Requests - Session Attribute Values metric in the Server Side Performance > Transaction based Measures > Business Transaction Evaluation/Filter/Splitting Values group. Give it a name, such as Demo Session Attribute Value. In the URI field of the Business Transaction Evaluation/Filter/Splitting Values Specific Attributes pane, select equals from the list, and type /orange-booking-finish.jsf. In the Session Attribute field of the Business Transaction Evaluation/Filter/Grouping Values Specific Attributes pane, type loginBean.getUserContext().getUserName(), and select contains from the Match list. Now you can create splitting Business Transaction. In the System Profile Preferences dialog box, select the Business Transactions item. Give it a name, such as Demo Splitting. In the Filter pane, click + to add a filter measure. Find and select the easyTravel Search measure, to get web requests for our business transactions. In the Split Results pane, click + to add a splitting measure. Find and select the Demo Session Attribute Value measure. Save the new business transaction. Now you can use your business transaction. In the Cockpit, expand the Business Transactions node of the System Profile (easyTravel in this tutorial), and double-click the Demo Splitting. If you have just started easyTravel, you may have to wait while it produces some traffic, and new PurePaths are collected and analyzed.